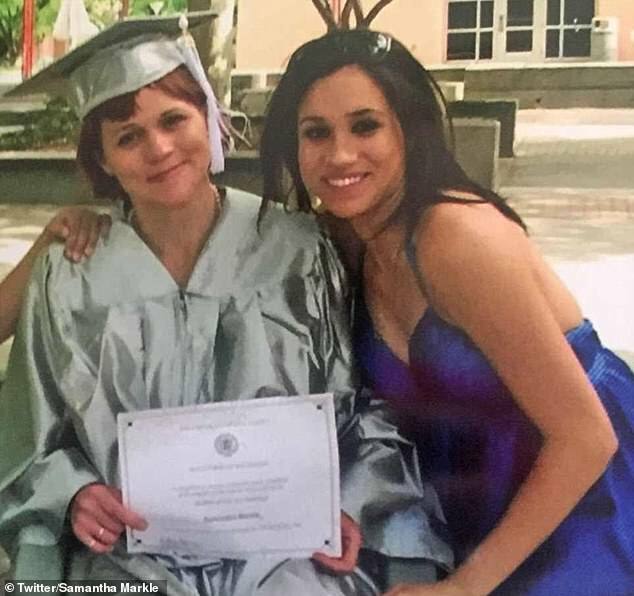 Meghan Markle’s estranged half-sister has won a battle to prove she is not on a list of ‘fixated’ people who police believe are a potential danger to the Duchess of Sussex and the British royal family. She told DailyMailTV that she feared the original claim that she was a danger to Meghan was was part of a ‘horrible PR strategy’ to silence her because of her past criticism of her sister. 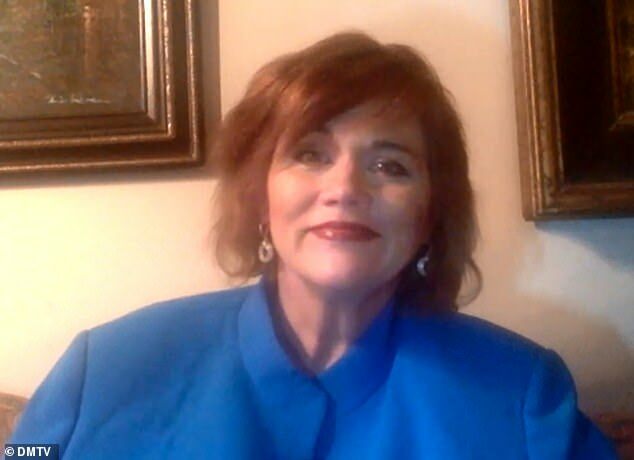 They responded by saying that they held nothing on her and that there is no ‘list’ of fixated people maintained by its special unit dealing with threats to the royal family and politicians, which is called the Fixated Threat Assessment Center (FTAC). ‘Now that I know there is no such thing as that list, I feel relieved. I’m pretty sure my sister knows that I’m not fixated,’ Samantha told DailyMailTV. ‘But I also know that she would prefer that everyone in the family be quiet – that’s ridiculous because the media talks about us collectively and individually. 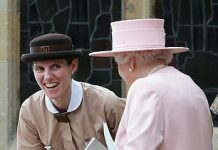 The claim she was on the list came from a police source who told The Sunday Times of London last December that Meghan’s own police guards had briefed the FTAC on Samantha. 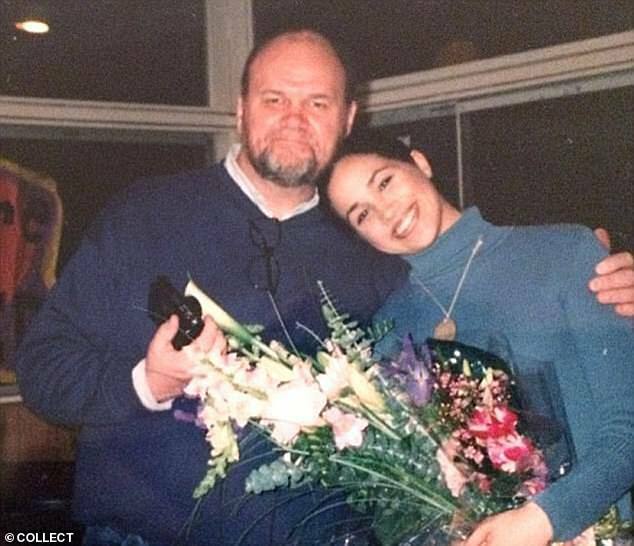 ‘You can’t protect someone like the Duchess of Sussex without knowing the background of her family. There is big potential for some major embarrassment for the royals,’ the source said. But the Duchess’ sister tells DailyMailTV: ‘Any suggestion that I am fixated on my sister is crazy. Stalkers and fixated people track individuals and harass them every day, constantly show up at their doors and are mentally unstable. She said: ‘It was a horrible thing to do. It was a horrible PR strategy – people have to be responsible and accountable. The sisters, who were born 17 years apart, have not spoken since 2008 and have had a rocky relationship, with Samantha initially branding her sister ‘a social climber’ and later a ‘Duch-a**’ on social media. Wheelchair-bound Samantha has since claimed the social climber comment was ‘taken out of context’ and said she is entitled to speak out as she sees fit – but still loves her sister and hopes to reconcile with her one day. 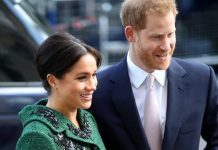 Two months later, a story published in a UK paper claimed Scotland Yard had placed her on a ‘fixated person list’ because of the ‘reputational risk’ she allegedly posed to the Royal Family. 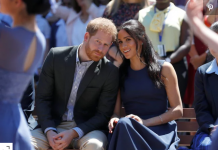 A source quoted by the Sunday broadsheet said: ‘You can’t protect someone like the Duchess of Sussex without knowing the background of her family. ‘But someone like Samantha presents a risk rather than a threat. 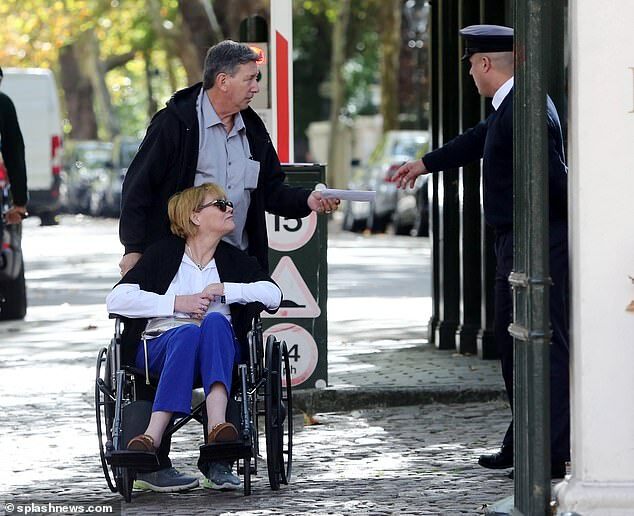 She is not committing criminal offences, but she is causing concerns for the royal family. 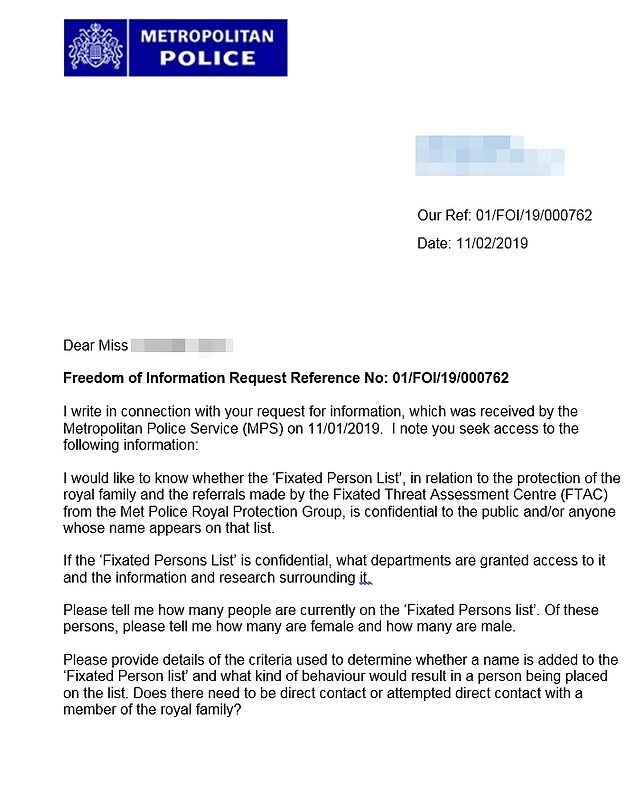 A second letter, detailing the response to a request lodged by Samantha’s lawyers using British freedom of information laws also denied the existence of a fixated person list. It added: ‘Searches were conducted at Royalty and Specialist Protection (RaSP) Command, in particular the Fixated Threat Assessment Centre (FTAC). 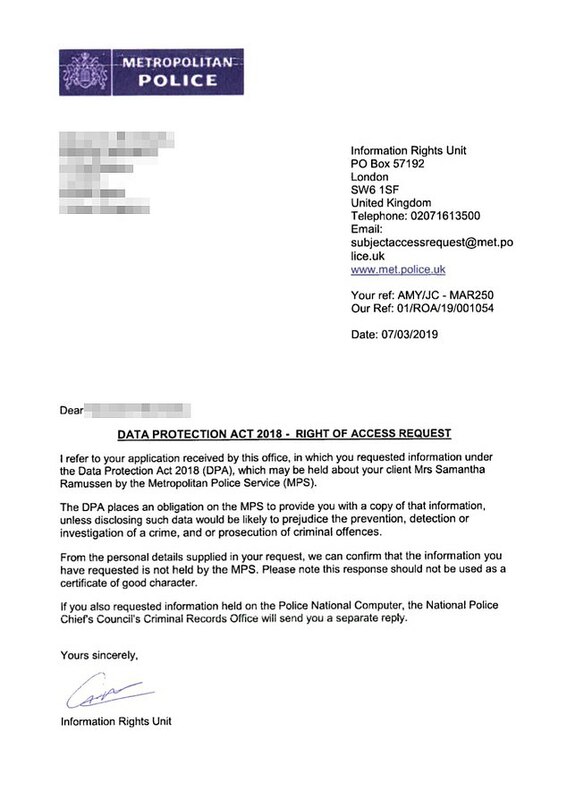 ‘The searches failed to locate any information relevant to your request. 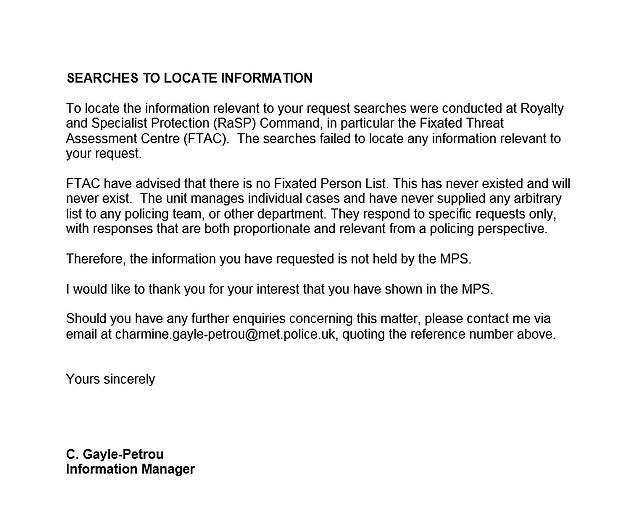 FTAC have advised that there is no Fixated Person List. This has never existed and will never exist. ‘The unit manages individual cases and have never supplied any arbitrary list to any policing team, or other department. Samantha says she doesn’t blame pregnant Meghan for the story and still hopes to be reunited with her younger sister in future. She said: ‘I don’t blame my sister for not interacting [with the family] because she has perhaps been too busy and she has a lot going on in her life. ‘We have extended an olive branch to her and it has not been reciprocated so far but let’s wait and see what happens. ‘If she did reciprocate and extend an olive branch, that would be wonderful and that’s what good humanitarians and diplomats do – especially with family.